Project obstacles and solutions: The Indiana Department of Transportation bid out a new flyover bridge across I-69 at State Highway 37. Milestone Contractors were awarded the job. 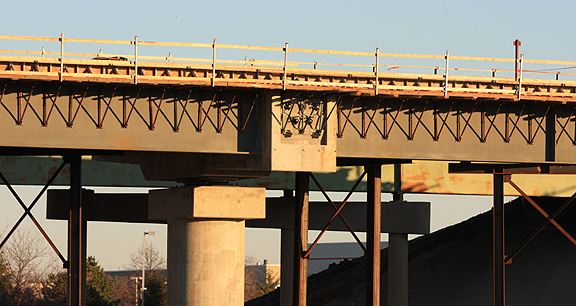 The bridge was designed to have three post-tensioned concrete piers supporting the deck. Each pier cap was constructed with 110 yards of concrete with strength requirements of 6,000 psi. The original specs called for the concrete to be delivered with a maximum temperature of 80 degrees F. Curing concrete typically heats up to well over 100 degrees F. This occurs by chemical reaction as the water hydrates the cement in the batch. The differential between the concrete temperature at the core of the pier and the outside of it was not to exceed 36 degrees F to prevent thermal cracking. The internal core temperature was not to exceed 160 degrees F. To meet these parameters, the original plan was to construct the pier with cooling tubes that would be filled with water to control the temperature of the concrete as it cured. However, Milestone consulted with CTL Group, a third party engineering firm, who wrote a thermal control plan. Their plan changed this spec and did not require the use of the cooling tubes. INDOT accepted the CTL recommended spec and reset the requirements. Without the hydro-cooling tubes, the concrete needed to be delivered at a much cooler temperature to prevent cracking. INDOT engineers reset their specs, asking for concrete to be 50-55 degrees F upon delivery to the site. Milestone turned to IMI to come up with a solution. IMIs Technical Services redesigned the concrete mix so that it could be cooled to INDOT specs without compromising strength requirements. This necessitated teamwork on the part of the plant personnel and Technical Services. First, all raw materials were cooled in their storage bins for several days. Next, the weather conditions were monitored closely. On the day of the first pier cap pour, the weather warmed up during the daytime hours to nearly 70 degrees and nighttime temperatures dropped into the low 40s. The concrete for this pier was batched with ice. The ice had to be precisely measured and shoveled into each truck by hand. Up to 115 lbs of ice were used per truck. The cementitious raw ingredients were reblended in the mix to keep the concrete temperatures low and strengths high. The fluctuation in ambient temperatures made it difficult to predict the amount of ice to use for each pour, if any, as well as anticipating the temperature rise during the pour itself. Everything was monitored for its impact on the mix. As the days for the second and third pier pour approached, the ambient temperatures dropped. IMI Technical Services batched the concrete normally-no ice-to meet the temperature and strength requirements. Beyond this, each batch had to remain workable as it was pumped into the pier forms. IMI Technical Services were on site monitoring slump, air entrainment and temperature to assure the consistency of each truckload. At 28 days from the pour, the concrete exceeded 6,000 psi, with strengths ranging from 7,220 - 9180 psi.